Pouvoir réaliser un pansement compressif est essentiel notamment lors de la prise en charge de trauma jonctionnels. La réalisation et la tenue dans le temps des pansements peut s'avérer complexe. Le produit proposé par cette société semble intéressant car il permet de pouvoir disposer sous un très faible volume/poids d'un équipement permettant un bandage compressif large. Une revue de littérature qui confirme que le bien fondé de l'emploi des pansements hémostatiques n'est pas si solide que cela. Pansement compressif et packing de plaie sont des valeurs sûres. Pansement hémostatique: Restons critiques ! Gegel BT et Al. Am Surg. 2011 Feb;77(2):162-5. L'efficacité des pansements hémostatiques apparaît être une évidence. Ils sont utilisés de manière large sans véritables fondements scientiifiques prouvés. Une analyse critique s'impose, ce d'autant qu'il s'agit de produits onéreux et que l'industrie a bien façonné notre manière de raisonner. Cet article le rappelle. Trauma is a leading cause of morbidity and mortality. Uncontrolled hemorrhage related to the traumatic event is often the major cause of complications and death. The use of hemostatic agents may be one of the easiest and most effective methods of treating hemorrhage. The US military recommends a hemostatic combat gauze (QuikClot Combat Gauze) as the first-line hemostatic agent for use in treatment of severe hemorrhage. This review provides essential information for evidence-based use of this agent. The PICO (patient, intervention, comparison, outcome) question guiding this search for evidence was: Is QuikClot Combat Gauze, a hemostatic agent, effective and safe in controlling hemorrhage in trauma patients in the prehospital setting? The evidence appraised was a combination of lower-level human and animal research. It did not conclusively demonstrate that this combat gauze is an effective hemostatic agent for use in trauma patients, but the results are promising in supporting its use. The evidence does not describe serious side effects, exothermic reaction, and thromboemboli formation associated with other hemostatic agents. Further inves tigation to determine the effectiveness of hemostatic agents, specifically QuikClot Combat Gauze, in the management of trauma casualties in the prehospital setting is required. These should include large-scale, multicenter, prehospital randomized controlled trials. Il existe une grande variété de pansements compressifs. L'armée française utilise le pansement dit israélien de la société Persys Medical et le pansement Olaes modular bandage de la société TacMed Solutions. En plus des bandes de compression, d'autres dispositifs on fait leur apparition visant à contrôler les hémorragies par une compression plus proximale (le CROC, le tourniquet abdominal, le SAMTourniquet, le Junctional emergency treatment tool). Ces dispositifs ont recours à des dispositifs de compression. L'Aiwrap est un pansement compressif proche des pansements en dotation auquel est adjoint une vessie qui une fois gonflée va majorer de manière importante la compression sous le pansement. Son positionnement dans une gamme de produit reste à préciser. Un article qui complète le précédent et qui doit appeler à de la mesure sur l'emploi des pansements hémostatiques. Bien qu'il existe de nombreux travaux comparatifs prônant l'intérêt de tel ou tel dispositifs, le bien fondé de leur emploi extensif ne peut toujours pas être affirmé en condition de combat. Les messages pédagogiques doivent donc avant tout porter sur l'application correcte des pansements compressifs et le packing de plaie. Exsanguinating extremity wounds remain the primary source of battlefield mortality. Operating forces employ three agents in Iraq: HemCon® (HemCon Medical Technologies, Inc., Portland, OR), QuikClot® (Z-Medica Corporation, Wallingford, CT), and CELOX™ (SAM Medical, Tualatin, OR). Anecdotal reports suggest that these agents are less useful on small entrance, linear-tract injuries. ChitoFlex® (HemCon Medical Technologies, Inc., Portland, OR) has been introduced but is untested. To compare the equivalency of the ChitoFlex® dressing, QuikClot® ACS+™ dressing, CELOX™, and standard gauze in their effectiveness to control bleeding from non-cavitary groin wounds. Forty-eight swine were randomly assigned to one of four treatment groups: standard gauze dressing (SD), ChitoFlex® dressing (CF), QuikClot® ACS+™ dressing (QC), and CELOX™ dressing (CX). A groin injury with limited vessel access was created in each animal. Subjects were resuscitated with 500 mL of hetastarch. The primary endpoint was 180-min survival. Secondary endpoints included total blood loss in mL/kg, incidence of re-bleeding, survival times among the animals that did not survive for 180 min, failure to achieve initial hemostasis, incidence of recurrent bleeding, time to initial re-bleeding, amount of re-bleeding, and mass of residual hematoma. Survival occurred in 10 of 12 SD animals, 10 of 12 CF animals, 10 of 12 QC animals, and 9 of 12 CX animals. No statistically significant difference was found. In our study of limited-access extremity bleeding, ChitoFlex® performed equally well in mitigating blood loss and promoting survival. The ChitoFlex® dressing is an equally effective alternative to currently available hemostatic agents. However, no agents were superior to standard gauze in our model of limited access. Un travail intéressant qui s'interroge sur le vrai intérêt des pansements hémostatiques. Sans remettre en question ce dernier cet article remet en question le positionnement de ce type de matériel. Dans un travail expérimental sur un modèle animal, un packing de plaie avec de la gaze simple serait plus rapide et tout aussi efficace qu'un packing effectué avec le Combat gauze ou le celox gauze. Results: All animals survived to study end. There were no differences in baseline physiologic or coagulation parameters or in dressing success rate (SG: 8/8, CG: 4/8, XG: 6/8) or blood loss between groups (SG: 260 mL, CG: 374 mL, XG: 204 mL; p > 0.3). SG (40 seconds ± 0.9 seconds) packed significantly faster than either the CG (52 ± 2.0) or XG (59 ± 1.9). At 120 minutes, all groups had a significantly shorter time to clot formation compared with baseline (p < 0.01). 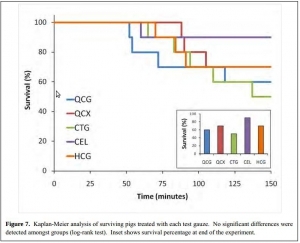 At 30 minutes, the XG animals had shorter time to clot compared with SG and CG animals (p < 0.05). All histology sections had mild intimal and medial edema. No inflammation, necrosis, or deposition of dressing particles in vessel walls was observed. No histologic or ultrastructural differences were found between the study dressings. "There are reasons that standard woven gauze bandages have existed for millennia. They are lightweight, absorbent, highly conformable, stable in a variety of environmental conditions, and inexpensive. Multiple advanced hemostatic agents have resulted in superior homeostasis, improved outcomes, and likely saved lives compared with SG when applied according to manufacturers’ recommendations for compression time. However, in a care under fire scenario or in a situation of mass casualties, compression times of 2 minutes to 5 minutes are not feasible. During ongoing battle, only lifethreatening injuries should be addressed and often the wounded must self-apply a tourniquet or dressing. An individual rendering self or buddy aid will need to continue to engage in battle as the first priority. Major vascular injuries, which cannot be controlled through application of a tourniquet, must be addressed as quickly as possible before profound bleeding incapacitates the casualty. Similarly, when there are persons with multiple injuries or wounds to treat, dressings must be rapidly placed and effective without prolonged hold times"
Background: The 6th edition of the PHTLS textbook discusses three topical hemostatic agents which were approved by the U.S. Food and Drug Administration and available for prehospital use at the time: HemCon dressing, QuikClot, and TraumaDex. Data on these products was based primarily on anecdotal military reports and very little data was available on their use in the civilian prehospital setting. Several new products have arrived on the market after the release of the 6th edition of PHTLS and several important new studies have been published which will be reviewed here. The vast majority of these products have been researched and developed for use in the military setting in Iraq and Afghanistan although some limited civilian data is also available. The perfect hemostatic dressing does not exist. Ideally, the dressing should be lightweight, easy to store, and able to be rapidly applied to a hemorrhaging wound. It should be conformable to the wound, allowing the hemostatic agent to reach areas of injury which are difficult to access with direct pressure (i.e. deep groin wounds). The dressing should cause minimal local tissue destruction, be easily removable from the wound, and not contain particles which can spread systemically. Finally, the dressing must not be washed away by rapid bleeding from high-flow blood vessels. Manufacturers have tried various methods to deliver hemostatic agents into bleeding wounds. Some products are packaged into a granular form which can be poured directly into the wound. Others are incorporated into a dressing or mesh which allows the provider to apply direct pressure to the site of injury. This dressing can be formed either as a rigid bandage, a small bag, or a gauze which must be unrolled prior to application. Each method of preparation has distinct advantages and disadvantages depending on the location and type of injury being treated. WoundStat: WoundStat was an FDA-approved mineral-based agent consisting of granular smectite, a nonmetallic clay. When the granules were exposed to blood they absorbed water, swelled, and formed a clay paste with strong adhesiveness to the surrounding tissue. Initial studies were promising6,7,8 and it was used by the U.S. Army for a short time. However, later data demonstrated that the granules could cause injury to the blood vessels and make repair difficult. The granules were also shown to enter the circulatory system and cause thrombosis in distal organs.9 Because of these potentially serious side effects, the U.S. Army announced in April 2009 that WoundStat would no longer be used by their medical personnel. QuikClot: QuikClot (Z-Medica, Wallingford, CT) is a granular product consisting of kaolin, which is a combination of inert minerals such as silicon, aluminum, magnesium, and sodium found in volcanic rock. When placed in a bleeding wound, it absorbs water thereby increasing the local concentration of clotting factors, platelets, and red blood cells to stimulate clot formation. A byproduct of its mechanism is a severe exothermic reaction, with heat generation of up to 70̊ C (158o F). This heat generation causes local tissue destruction and even burns. QuikClot has been studied in both the military and civilian sector, with up to 92% effectiveness in stopping hemorrhage.10 QuikClot was issued to U.S. soldiers in the Iraq and Afghanistan conflicts. Civilian use has been by a wide range of providers, including EMT/firefighters, paramedics, and police. Examples of civilian use include treatment of severe lacerations, gunshot wounds to the neck and even hemodialysis catheter dislodgement. Trauma surgeons have also used QuikClot for successful treatment of bleeding during surgery in the chest, abdomen, and pelvis. QuikClot was noted to have two significant weaknesses. Since it is a granular powder poured into a wound, it had limited usefulness in high-pressure bleeding (i.e. femoral artery bleed)as the granules were washed away by the bleeding before they were able to form a clot. Furthermore, the heat generated from its use was associated with several burns. QuikClot production was stopped after development of several newer generation products. These newer generation products have minimal heat production and are packaged both as gauzes and in a bagged form. Currently Z-Medica sells QuikClot packaged in 2”x2” and 4”x4” gauze pads for use on superficial lacerations which don’t have severe bleeding. QuikClot has also developed a small kaolin-impregnated pad (QuikClot ACS+) and as a laparotomy pad (QuikClot Trauma Pad) for use by trauma surgeons in the operating room for cases of severe bleeding during surgery. This later product remains in the research phase and is not yet approved for widespread use. QuikClot Combat GauzeTM is a 3”x4 yard long roll of nonwoven gauze impregnated with kaolin. Combat Gauze has all the advantages of normal gauze (easy application, flexible, large coverage area, and easily removable) with the additional advantage of hemostatic function from the kaolin. It is designed for packing into deep wounds which are actively bleeding (i.e. arterial injury in the groin). Prehospital personnel can also use combat gauze as they would any standard Kerlix gauze. Combat Gauze was recently compared to several newer generation products, including the HemCon RTS, and found to be superior and had no apparent side effects.11 Currently, QuikClot Combat Gauze is the only product endorsed by the Tactical Combat Casualty Care Committee and they recommend it as first line treatment for life-threatening hemorrhage on external wounds not amendable to direct pressure and tourniquet placement. - Numerous topical hemostatic products have been developed and released onto the market. - Some of these products have since been discontinued, while others are widely used. -Economic and medical considerations continue to make this a rapidly evolving and growing area of prehospital care. It is important for the EMS provider to remain cognizant of these products and their advantages, disadvantages, and complications as they continue to evolve. PHTLS Recommendation: Topical hemostatic agents may be used to control hemorrhage occurring in sites not amenable to tourniquet placement and which cannot be controlled by direct pressure alone. Achneck HE, Sileshi B, Jamiolkowski RM, et al. A comprehensive review of topical hemostatic agents: Efficacy and recommendations for use. Annals of Surgery 2010; 251: 217-228. Mabry R and McManus JG. Prehospital advances in the management of severe penetrating trauma. Crit Care Med. 2008:36(7);S258-266. Brown MA, Daya MR, Worley JA. Experience with chitosan dressings in a civilian EMS system. J Emerg Med. 2009;62:239-243. Kozen BG, Kircher SJ, Henao J, et al. An alternative hemostatic dressing: comparison of CELOX, HemCon, and QuikClot.Acad Emerg Med. 2008; 15:74-81. Devlin JJ, Kircher S, Kozen BG, et al. 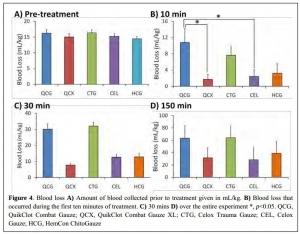 Comparison of ChitoFlex, CELOX, and QuikClot in control of hemorrhage. J Emerg Med. 2009 Apr 1 (Epub ahead of print). Ward KR, Tiba MH, Holbert WH, et al. Comparison of a new hemostatic agent to current combat hemostatic agents in a swine model of lethal arterial hemorrhage. J Trauma. 2007;63:276-284. Kheirabadi BS, Edens JW, Terrazas IB, et al. Comparison of new hemostatic granules/powders with currently deployed hemostatic products in a lethal model of extremioty arterial hemorrhage in swine. J Trauma. 2009;66:316-328. Arnaud F, Parreno-Sadalan D, Tomori T, et al. 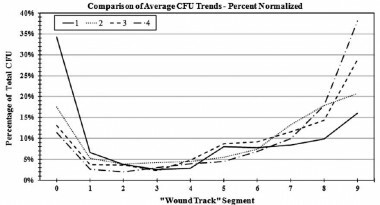 Comparison of 10 hemostatic dressings in a groin transaction model in swine. J Trauma. 2009;67:848-855. Bheirabadi BS, Mace JE, Terrazas IB, et al. Safety evaluation of new hemostatic agents, smectite granules, and kaolin-coated gauze in a vascular injury wound model in swine. J Trauma. 2010;68:269-278. Rhee P, Brown C, Martin M, et al. QuikClot use in trauma for hemorrhage control: case series of 103 documented uses. J Trauma. 2008;64:1093-1099. Kheirabadi BS, Scherer MR, Estep JS, et al. Determination of efficacy of new hemostatic dressings in a model of extremity arterial hemorrhage in swine. J Trauma. 2009;67:450-460. Un article récent fait le tour des pansements hémostatiques. Uncontrolled haemorrhage is a leading cause of prehospital death after military and civilian trauma. Exsanguination from extremity wounds causes over half of preven military combat deaths and wounds to the anatomical junctional zones provide a particular challenge for first responders. Commercial products have been developed, which claim to outperform standard gauze bandages in establishing and maintaining non-surgical haemostasis. Since 2004, two advanced haemostatic dressing products, HemCon and QuikClot have been widely deployed in military operations. Newer products have since become available which aim to provide more efficient haemostasis than and thus supersede HemCon and QuikClot. To conduct a systematic review of clinical and preclinical evidence to compare the relative efficacy and safety of available haemostatic products, which are of relevance to pre-hospital military and civilian emergency medical providers. An English language literature search was performed, using PubMed® and Web of Knowledge® Databases, with cross-referencing, focussed product searches and communication with product manufacturers. For studies employing animal models, the injury model was required to produce fatal haemorrhage. Products were categorised by primary mode of action as either factor concentrators, mucoadhesive agents or procoagulant supplementors. From 60 articles collated, 6 clinical papers and 37 preclinical animal trials were eligible for inclusion in this review. Products have been tested in three different types of haemorrhage model: low pressure, high volume venous bleeding, high pressure arterial bleeding and mixed arterial-venous bleeding. The efficacy of products varies with the model adopted. Criteria for the ‘ideal battlefield haemostatic dressing’ have previously been defined by Pusateri, but no product has yet attained such status. Since 2004, HemCon (a mucoadhesive agent) and QuikClot (a factor concentrator) have been widely deployed by United States and United Kingdom Armed Forces; retrospective clinical data supports their efficacy. However, in some recent animal models of lethal haemorrhage, WoundStat (mucoadhesive), Celox (mucoadhesive) and CombatGauze (procoagulant supplementor) have all outperformed both HemCon and QuikClot products. HemCon and QuikClot have augmented the haemostatic capabilities of the military first aid responder, but newer products demonstrate potential to be more effective and should be considered as replacements for current in service systems. These products could have utility for civilian pre-hospital care.